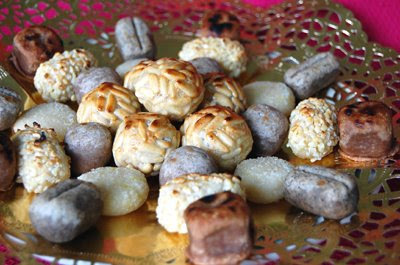 Panellets are the special sweet treats we Catalans have for La Castañada. A castaña is a chestnut and these days… your Halloween time… here in Catalonia it’s typical to toast chestnuts, bake sweet potatoes and also bake panellets. Remember I always tell you that here we don’t bake sweets at home that much? Well, panellets are the exception! Even at kinder garden, kids learn how to do them!!! The main ingredients are: almond, sugar and water. The basics for a marzipan. Some people also add some potatoes, but this recipe won’t have any. Adding the potatoes will help get more panellets done in the same batch and it’s basically added because almonds are not cheap and potatoes are. My recipe is done with no potatoes, if you want to add some, check proportions… I don’t know how much you should add. Last year (I love to say that… he, he) I posted about All saints day and promised that I would upload the Panellets recipe… better late than never ;D.
Believe me if I tell you that I normally don’t bake, but I must have some kind of fever that when I enter the kitchen the oven seems to call me and I end up baking something in there. That’s why I chose Lou Reed song: Take a walk on the wild side, being “the wild side” my baking “side” ☺! This time I’ve performed 8 different kinds of Panellets… don’t panic! It’s easy because the basic dough is the same all the time and we will only add small doses of flavour to make the different kinds. I did chocolate ones, pine nuts, almonds, lemon, cinnamon, strawberry jam, coffee and fruits jelly. Here in this post you will only find the: cinnamon, coffee, chocolate, pine nuts, almond and lemon. But will be enough to get the idea of how to bake them. So, let’s put our aprons on and start the kitchen Feast! 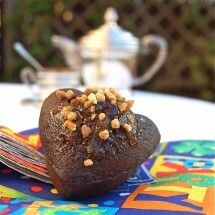 Ingredients for the marzipan: 500 grs of superfine ground almond, 500 grs of superfine ground sugar and 100 grs of water. Start the dough by mixing the ingredients. Even though you think you might need more water, don’t add more because it wouldn’t work. Your fingers will get very sticky but after a little while it will get better. Wrap the kneaded dough with transparent kitchen film and keep in the fridge for 1/2 hour. *First kind* Meanwhile prepare the space where you will do the panellets: Clean the surface and have the following ready: 1 teaspoon of ground coffee, 1 teaspoon of melted chocolate, 1 teaspoon of ground Cinnamon, 1 teaspoon of strawberry jam, 1 teaspoon of lemon juice and 1 teaspoon of its grated peel. *Second kind* Whisk one egg and prepare a bowl with 200 grs of pine nuts and another one with 200 grs chopped almonds. Instructions: Take the dough out of the fridge and put it over a clean surface. With your hands knead it until you get this shape. Then cut in 8 parts. Each of these parts will be one batch of panellets. 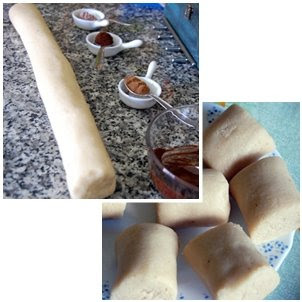 Take the first one of the parts make a small hole in the middle and pour the teaspoon of cinnamon (for example). Knead until you get an homogeneous color and give it a cylindrical shape, and again divide in 8 equal parts. Once you have them, give the shape you want (I made a ball) and reserve. Follow same procedure for the First kind panellets. 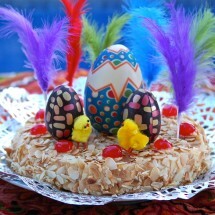 To make the almond and pine nuts ones, get the egg whisked and the bowls with the pine nuts and almonds ready. Have the marzipan ready in balls (pine nuts) and in little croquettes (almonds). Moist your hands with the egg, take the marzipan 8th portion of the 8th portion (doubts here?) and spread the egg all over with your hands, then take a handful of pine nuts and rub carefully against the marzipan ball, don’t press too much, don’t let too loose. Once the nuts get adhered to the ball, reserve. Follow same procedure for the almond ones. Baking Time.- Preheat oven at 250 or more if you can and turn the upper heat on at maximum. Bake them by colours, don’t mix, just eight by eight. Place some oven paper on an oven tray and put, for example, the coffee ones. Place in the upper rack. Don’t do other things while panellets are in the oven, just look at them! Baking, can take only 30 seconds, or a bit more, or a bit less… Just watch them carefully and when they start getting some colour, take them out. Don’t manipulate them, they are soft now, reserve and let them get cold. Go for the next until you have them all over your kitchen counter. Once cold present in a golden or white beautifully worked kitchen paper and have with sweet wine. 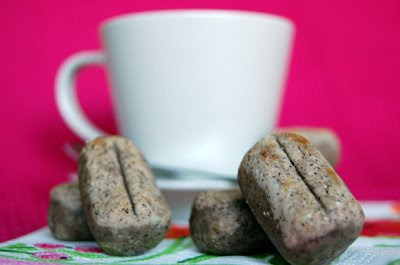 I’m sending the Coffee Panellets to Meeta and her Monthly Mingle: Coffee and Tea. Hope you like them, darling :D. You still have time to send your recipes over her blog, just check the terms and join the party! Looks like the makings of a lovely tea party. Glad you’re rested and back with us! 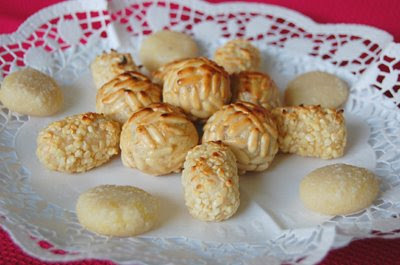 Oh, I love panellets and so thank you for the recipe! My (Catalan) boyfriend’s family sent some over one year and they were so delicious! Oh sounds so good! 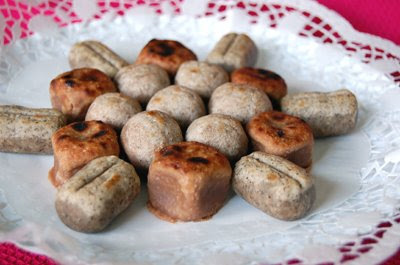 I love these types of confections,I love Turrónes, your Panallets sound tasty, mmmmm using ground cuban espresso would be awesome for the coffee one’s. 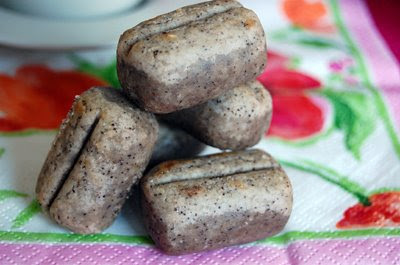 Mexicans make something called “Mazapan” similar to Marzipan but done with peanuts instead of almonds. In USA those are available from a brand called “de la Rosa” but in Mexico they have better one’s sold that are chocolate coated BUT I can’t find those in USA I only get them when I go to Mexico. These look soooo interesting and tasty. I’d love to try these! oh my gosh those sound so good and gluten free!!!! i wanna make those for christmas presents!! I saw traditional treat on the post header & almost fell off my chair Nuria! I know you hardly bake ‘sweet’ stuff…well done. These are precious & delicious. Coffee is my fave & I’m so glad it’s headed for the mingle! I love the flavours you’ve worked into each. Totally yummy! Hola Nathan! You are always so didactic!!!! Thanks :D. Here we call it Mazapán too and it’s the basis of the panellets. You can also coat them with chocolate here or grated coconut. Aaaahhhh Deeba, yes… I hardly bake and did these ones specially for you all! So happy you appreciate it :D. Thanks so much for your commforting words! HOpe that monday I will be able to visit your blogs… I’ve been a bit tired/lazy/down lately. I think the pine nut would be my favorite … want to reach in through my monitor and grab one! They look beautiful and delicious. And I can imagine they would be ideal to package and give away during the holidays, right? Ay que rico! I love things related to marzipan, these look so yummy! Keep baking Nuria!! They sound lovely with all those flavours. What a great sweet treat Nuria! Thanks for your comments!!! I’ll be visiting your blogs soon. these look great…mmmm. but i have to say, the little brown ones look like tiny sausages! they made me hungry for sausage! Nuria – I have heard of panellets and even had them when i was in madrid a few years back! but i never had any with coffee in them! brilliant. so glad you are bringing these treats to the MM! 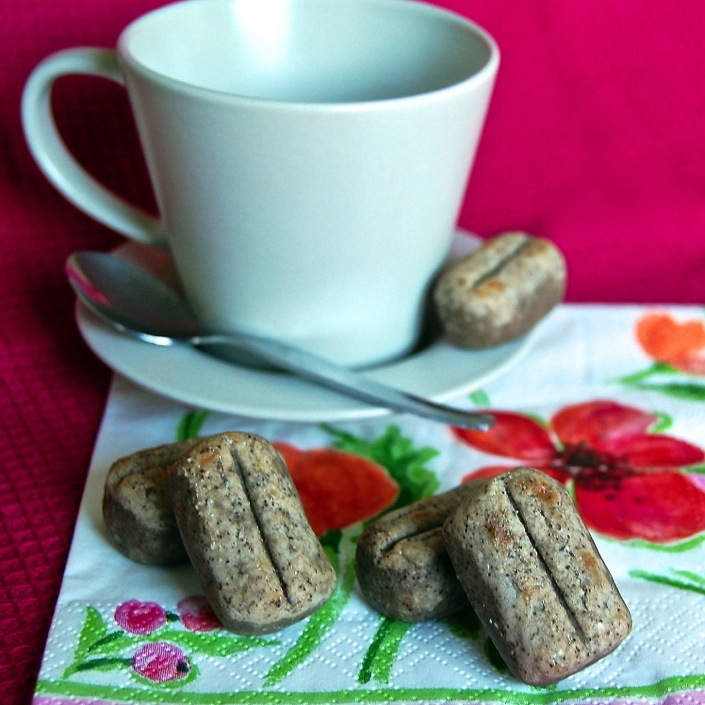 you mentioned in my blog that my nut cookies look like panellets and now that I look at your recipe, they really are of the same breed, just that mine only have plant based things in them, Your recipe pictures are awesome! Nuria, these are beautiful!! Being Spanish, I also don’t bake much, haha! My mother never baked, we always ate fruit :) But, I wanted to ask you. I’ve been trying so hard to replicate one of my favorite Spanish treats, polvorones! Now that the holidays are coming, I wanted to bake a batch. I just can’t seem to get it right. Any suggestions?? 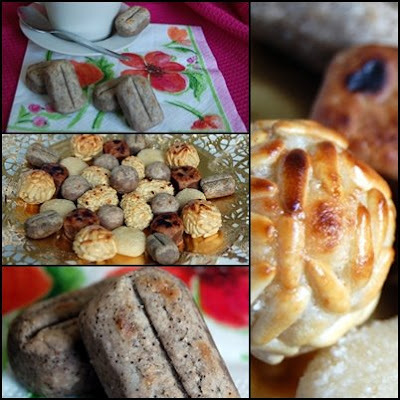 I posted a link to your recipe for pannellets on my blog about pannellets. One of our Catalan friends invited the kids and I to make pannellets together. I can’t wait! Who would imagine that something so delicate and beautiful is so simple to make. At school the kids made them using sweet potatoes. your recipe was perfect and the panellets were delicious! Everybody likes it! I made panellets on All Saints Day and write a post about it on my blog referring to your fantastic site. your recipe was perfect and the panellets were delicious! Everybody likes it! I made them on All Saints day and wrote a post about them referring to your fantastic site. Thanks a lot! Thanks for leaving a comment with this link on my blog. I found a recipe (although including potato) and have made some panellets. They’re nice, but will save this recipe and try it without the potato. Took these to church coffee hour on All Saints Day. Not a one was left. They are easy to make and delicious. 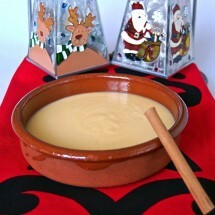 Crema Catalana, Natillas and Polvorones: This is Xmas and Season’s Eatings!!! !